Greetings! 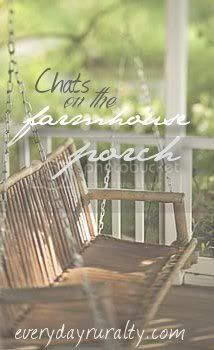 Welcome to the porch. I made sweet rolls for my visitors and we have iced tea, hot tea, and coffee. Have a seat and let's visit. Are you a morning person, someone who does best in the middle of the day, or a night owl? If you were a dog, would you be a) a Poodle, b) a Retriever, c) a Sheep Dog, or a d)Chihuahua? Please tell us about what you're reading now. Yes. I keep the supplement industry in business. I can tell the difference when I don't take them, so I know they are working for me. I'm reading a book about Novel Writing. It has lots of charts and forms to keep a writer organized. Perhaps it just keeps a writer filling out charts and forms instead of writing a book. Huh? I'd zap my mudroom/back porch and make it 6-8 feet further out. I'd take out all the walls and windows and have everything built new. I'd keep the bathroom/laundry room, but it would be made nicer. I'd have a large closet put in with lots of shelves and storage space. The room with the closet would be the master bedroom. Then I could take the room I'm in now and make it a dining room again. We have a great room type thing going on and I miss having a dedicated dining room. i used to be a morning person, but these days i'm all over the place. only take chromium and fish oil. renovate one room. hmmm. i think i'd have you wallpaper our 2nd bath/laundry room. it has cat wallpaper in it and we've never redone it since buying this place. Texwis- I definitely think you need dog wallpaper this time. I think your pack would agree! Patrice, I get up early but never feel rested because I go to bed late. I take my Vitamins and supplements most every day. 1. I'm most definitely a morning person. I hope out of bed at the crack of dawn and I'm ready to go, go, go! It drives my hubby nuts. He needs a full hour to get up to speed - I have never understood how that could be! 2. Nope. I buy them and then forget to take them! 3. I would probably have to say I'm like a poodle. I have curly hair and tons of energy. If something is going on in my life, I probably am viewed as being 'yappy'! 4. I'm reading "Going, Gone" by Laura Crum. It's slow going because I only read when I go to bed, and I usually only go to bed when I'm ready to sleep! 5. Oh, please zap away the pink tile in the guest bath! We haven't renovated the upstairs of our project house, and that's the only thing up there that is really really ugly! Well, at least we'd be in the same dog show :) Great questions today. I never used to be a morning person but now I LOVE getting up anywhere between 4:30 and 5:30. When I take Tuck out to walk not many people are out there and the ones who are don't like to talk in the morning either! It's glorious! Late again...sorry!! At this rate I might have to just join once a month and answer 20 questions at once!!! ;-) HOPE you have a great rest of the week and weekend!! !